Upgrade your meeting, eating, working, or learning spaces with the OFM multi-purpose table. With its solid construction and variety of tabletop finishes, this table is an ideal addition to any environment. Its 1.25" thick high pressure laminate top is finished with black edge banding to protect it from dings or damage, and features a honeycomb core design that is durable yet lightweight. 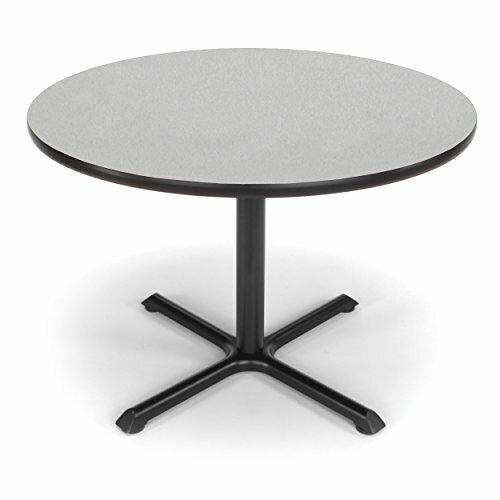 The classic X-style pedestal base is constructed from strong steel and powder coated for a long-lasting finish. Nylon leveling guides on each of the four feet ensure a stable tabletop and protect floors from damage. 42" diameter table measures 29.5" high. This XT42RD-GRYNB-OFM meets or exceeds industry standards for safety and durability, and is backed by OFM limited lifetime warranty.